I was just too miserable and stressed last weekend to write, it would all have come out mopey and depressing. Strange, for someone who had a week off work and nothing to do! I did end up doing housework, and in the process discovered we have a big problem with a rat. There were droppings tucked in corners all over the ground floor of the house, and random pieces of destruction lurking in odd places. For example I found a cushion which had fallen into the gap behind the sofa…only when I picked it up it had been half chewed up. We’d been hearing this rat occasionally for a few days, heard it wander into the house through the attic space in fact, but hadn’t realised it had moved in. Then on Friday we discovered that the little beggar had chewed its way through almost the entire contents of our kitchen food cupboard. So the entire afternoon was taken up with rescuing what we could and putting it in tins, then thoroughly scrubbing the inside of the cupboard. Nice way to spend my birthday! We tried traps, but it tripped them and ate the bait. Our plan was to remove all sources of food and block up all of its holes and hope it would go away. Then this week we discovered that it has eaten away all the insulation surrounding the mains electricity cables where they come up through the floorboards under the stairs. It looks like the cables themselves are intact (thank Heavens), but it’s still not a safe situation. In a bizarre twist, while searching for our home insurance documents, I stumbled across a leaflet from my bank, describing the home emergency cover I have with my bank account. Weirdly, they cover pest control, as well as wiring! So the rat-man has been and hidden poison bait under the floorboards and now we wait. Anyway, I’ve been back at work for a week now, and it’s business as usual. In knitting news, I’ve finished Heather’s shawl, but I’ve got no photos as I haven’t blocked it yet…must get on and do that. I have started a Mrs Christmas doll to send to my brother and his family in America, but again no photos, as there isn’t really much to see yet. 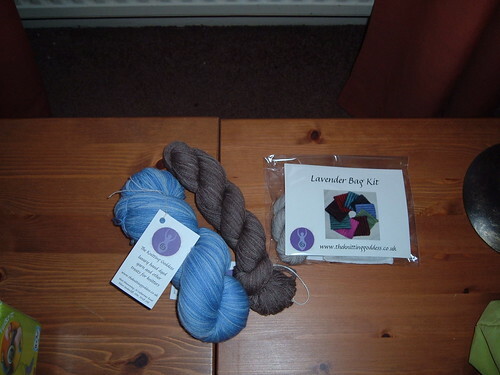 That’s some pretty blue sock wool, and a mini-skein of laceweight, both from the Knitting Goddess. I bought the laceweight with the intention of trying it as the border of my cobweb shawl. Sue from Knitting in the Library very kindly brought me in some yarn she had, but it is a much heavier weight and much rougher, and after trying it I’ve decided it isn’t quite what I want. I’m very grateful though, it was a lovely thought. This laceweight from the Knitting Goddess is slightly heavier than the cobweb stuff, but not by much, and the brown matches some of the shades in the main shawl really well. I’ll give it a try, anyway. This selection is from Violet Green, whose yarns I always love. The undyed laceweight is to knit a beautiful stole I have been looking at in a book my Mum bought for my birthday (Best of Interweave Knits). It’s complicated and delicate and would probably take a very long time. But it’s lovely so I might just try it anyway. The Cascade 220 is just because I can’t seem to help buying the stuff. 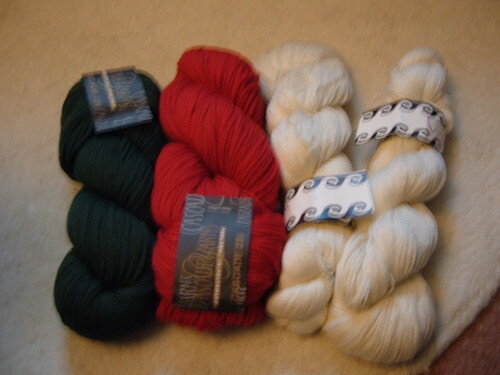 I now have 4 skeins, in 4 different colours and no particular plans for it. I’m pleased with it. Next I’m thinking of doing one for our niece, Amy. This afternoon we’re off shopping with Madison, our 7 year old niece, who gets to choose her own presents this year. She’s excited…I’m…kind of…not so much! This week is looking straight-forward, until Friday when A sets out on his annual outing with his mates. Then I get the weekend to myself, all of it! I’ll thoroughly enjoy Friday evening and most of Saturday, then I’ll start missing him and looking forward to Sunday afternoon. 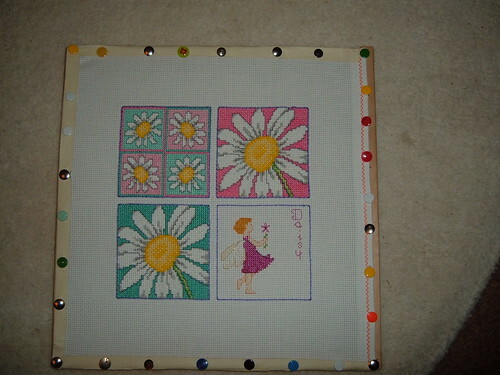 This entry was posted on November 21, 2009 at 11:16 am and is filed under Cross-Stitch, Home, knitting. You can follow any responses to this entry through the RSS 2.0 feed. You can leave a response, or trackback from your own site.